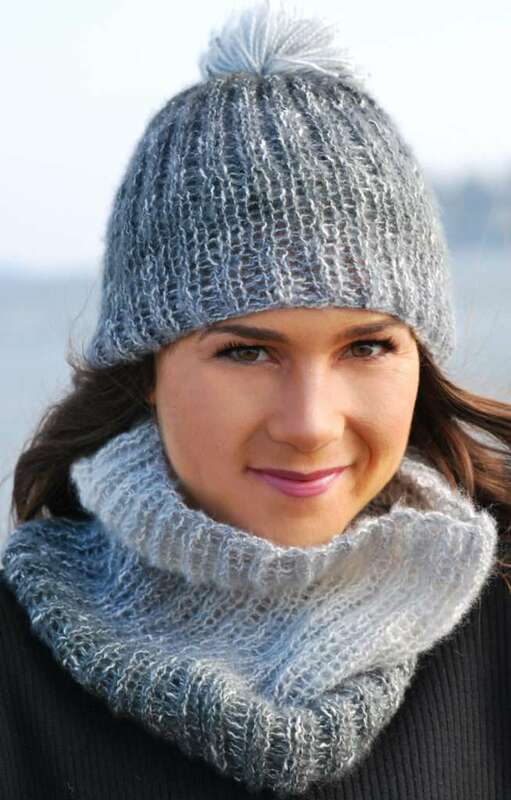 Most versatile cowl for any weather! 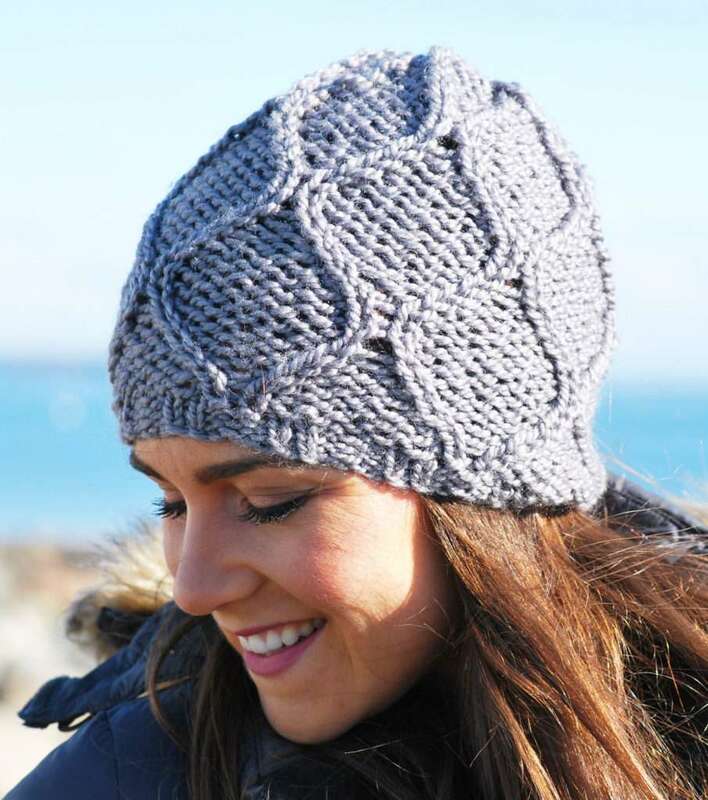 Wear it for warmth, or just as a fashion statement. Knit in fine, lightweight yarn. 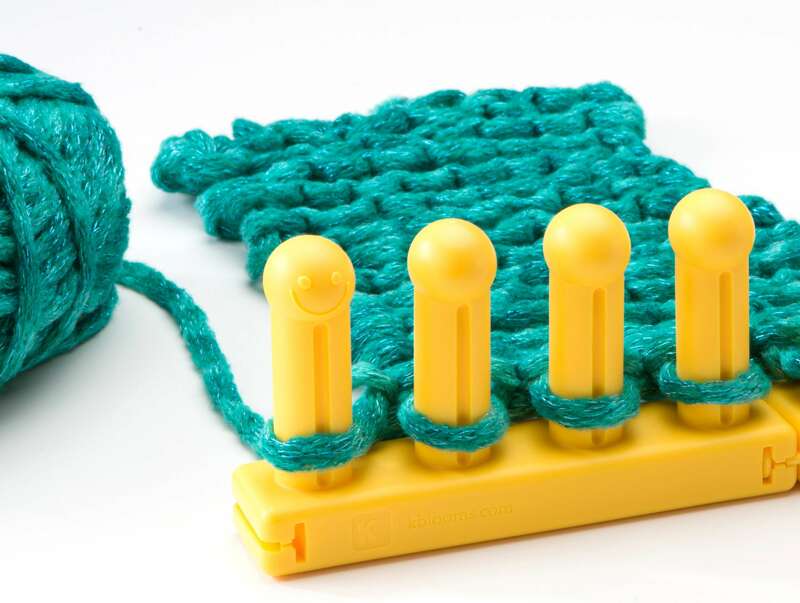 LOOM: ‘Rotating’ Double Knit Loom with 60 Peg Loom Toppers for cowl. Both are set up for double knit. YARN: Lion Brand ‘Shawl in a Ball’, #4 worsted yarn. Cotton and Acrylic blend, machine wash and lay flat to dry. Color, Feng Shui Grey. 1 skein is enough for both cowl and hat. SIZE: 12” x 23”, laying flat (doubled) for cowl. Hat fits 22-24” adult head. COWL Cast on all 60 pegs in Stockinette. Lay anchor yarn around loom to secure stitches. Repeat round one until knit is 12” from cast on stitches, or 50 rounds. Bind off loosely in rib stitch with crochet hook. Remove from loom. Bind off loosely at anchor yarn with basic bind off working one strand over one . Carefully remove the anchor yarn. Weave in any yarn tails. Both edges should be very stretchy. Your cowl should adapt to scrunched or rolled neck piece. It is also wide enough to be pulled up to cover your head. HAT Matching hat is made with the original 52 peg looms. Fits adult 22-24” head. Cast on all 52 pegs in Stockinette. Lay anchor yarn around loom. Rounds 7-18: Stockinette for fullness around head. 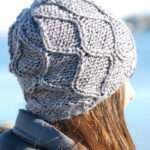 Change to Rib stitch and work until the hat measures approximately 9” from cast on. Cut yarn with about 12” of yarn tail remaining. Move inner loops onto outer pegs, so that there are 2 loops on each of the outer pegs and the inner loom is empty. Place the yarn tail onto darning needle. Go around loom and pick up the loops on each peg and place onto the yarn. Once the loops are all on the yarn, remove hat from loom. Gather the top of hat by pulling gently on yarn. Before pulling tight, go around the stitches again for a strong gathering yarn. Gather snuggly. 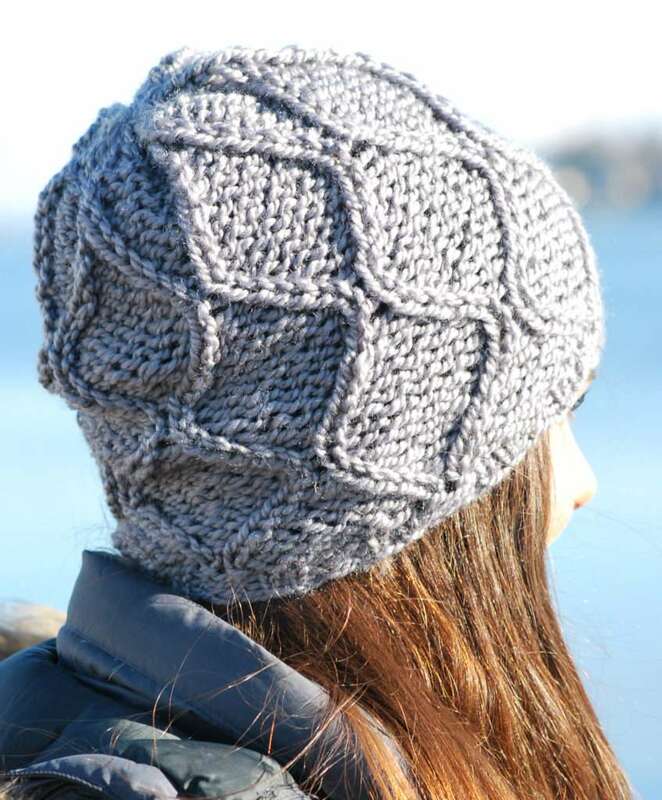 Knot on inside of hat with some securing stitches. Trim and weave in ends. Pom-pom: Start wrapping the yarn around fingers or 4” wide cardboard. Wrap approximately 100 rounds with the section of the skein of yarn to reflect the colors desired. Tie the rounds of yarn securely with a double strand of yarn with 4” tails. 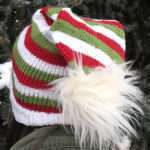 Once tied, these tails can be used to tie the pompom onto the hat. Cut the loops so that they are single strands. Cut pompom to desired length and shape. Tie and knot to inside of hat. Weave in yarn tails. LOOM: ‘Premium’ Chunky Round Looms, using 48 peg, 24 peg looms. Cast on 48 sts join to work in the round (recommend the non-loopy e-wrap cast on method). Rnds 1-5: p1, *k2, p2: rep from * to last peg, p1. 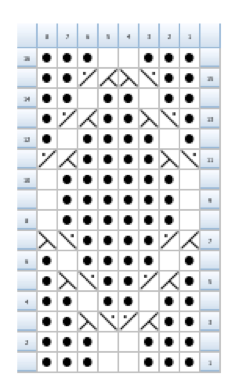 Rnds 6-38: Work Hourglass Stitch Pattern as shown on chart. Next 2 rnds: *k2, p2; rep from * to end of rnd. 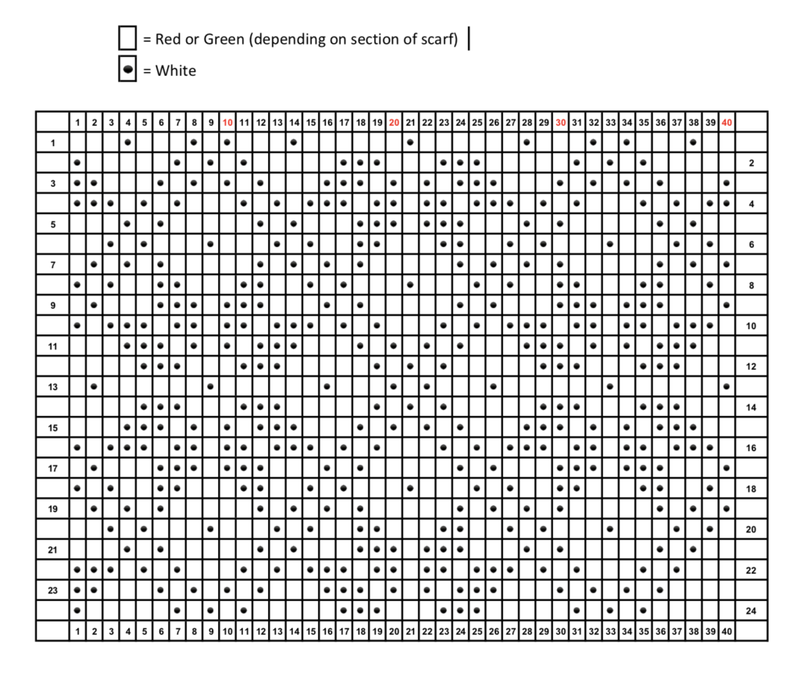 Transfer all the stitches to the 24-peg knitting loom, 2 stitches per peg. Next 2 rnds: *k1, p1: rep from * to end of rnd. Thread tapestry needle with yarn and finish with gather bind off method. Back Cross (BCP): Slip 1 stitch to cn and hold towards the center of the loom (peg is now empty), knit the next peg then move this loop to the emptied peg, place the stitch from the cn on the empty peg then proceed to purl it. Front Cross (FCP): Slip 1 stitch to cn and hold towards the front of the loom (peg is now empty), purl the next peg then move this loop to the emptied peg, place the peg from the cn on the empty peg, proceed to knit it. YARN: Approximately 600 yds of worsted weight acrylic yarn. Sample used Caron Simply Soft in Pistachio, White, and Autumn Red, 200 yards each. Cast On 40 double stitches with Stockinette (40 on both inner and outer looms). Be prepared to work a flat panel. Row 1-3: with R, S to end of row. Row 4-5: with W, S to end of row. Row 6: with G, S to end of row. Row 7-8: with W, S to end of row. Row 9-11: with R, S to end of row. Outer loom will all be R (red) inside loom will be W (white). Change colors based on chart. Repeat part 2 row 1-24, 10 more times. Repeat part 1 row 1-11. Remove each stitch from the inside loom and place on the outer loom. Each peg used on the outer loom (40 pegs) will have 2 loops on it. Treat both loops as one. Step 1:EW peg 1 and 2, KO. Step 2: Remove loop from peg 2 and place on peg 1, KO. Step 3: EW peg 1, KO. Move loop from peg 1 to peg 2. Repeat Step 1-3 until 1 stitch is left. Cut yarn at least 4 inches long. Remove last stitch from loom and pull the yarn tail through the loop. Weave in ends. 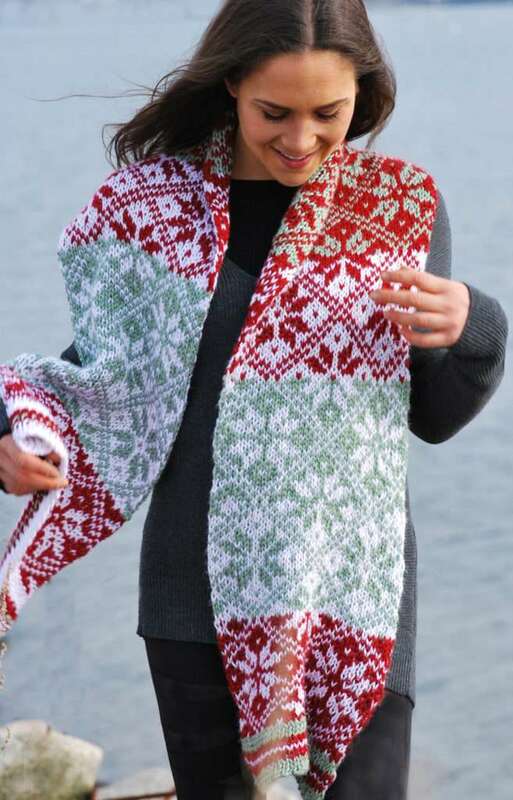 So excited to get this pattern, I enjoy all the KB Looms, when working on the free patterns if there is a chart and written directions, I try to work from the chart then double check my work with the written pattern, and in doing so, this time I found a mistake in the written pattern I want to share with others, to help save time.